Maria Farrar, Leaking, 2017, oil on linen, 71 x 51". There’s a school of painting that is easy to like: representational, with an edge of abstraction in the gestures, and frequently colorful with a touch of the fey. Yet this type of painting is very hard to do well—to make something both pretty and powerful. Great examples are Karen Kilimnik, Lisa Yuskavage, Mairead O’hEocha, and now, recent art-school graduate Maria Farrar. Farrar was born in the Philippines, raised in Japan, and trained as an artist at the Ruskin School of Drawing and Fine Art at Oxford and London’s Slade School of Fine Art. This history is embedded in her images—hints of different traditions hybridize into paintings that are, satisfyingly, just on the right side of strange. Like the majority of the works on show, Leaking, Suitcase, and Ants (all works cited, 2017) feature a young, dark-haired girl—kind of like a frazzled, mouthless sister to Olive Oyl—deftly outlined in quick, confident brushstrokes. 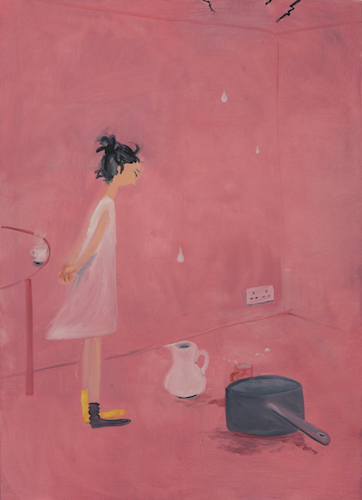 Against backgrounds of bright pinks, blues, and watermelon greens, the young woman gazes as water drips into a jug and pot; stands on an outlandishly enormous overstuffed suitcase; and watches a line of ants. Now look more closely: In Leaking, the outline of a table, pink on pink, is pure Matisse, while the question-mark curve of steam rising from a coffee cup in Sunday speaks to the traditions of Japanese calligraphy. Farrar’s pictures suggest both exterior narratives and emotional states. Shoes too big to fill, rendered in shades of gray, shows the figure as an artist and implies a fear of inheriting an overwhelming historical lineage. But this exhibition proves that Farrar is more than capable of stepping up to the challenge.